Mid Bloomer. Clustered red-purple flowers, 5 down-turned petals, smooth stem and leaves, hosts Monarch Butterfly larvae. Grows up to 2 feet tall with broad, heart-shaped, clasping leaves about 6” long. Notes: Milkweed family. One of the most useful plants (along with Soap Plant and Manzanita), milkweed is a native of America, where the American natives discovered its medicinal properties and taught them to the settlers in Virginia (reported in 1597). The plant’s name refers to the milky, white sap, or latex, which was used for skin ailments and is still used in folk medicine as a treatment for warts, ringworm, poison ivy, rattlesnake bite and other skin problems. It was even used for treating sores on horses. Some tribes used extracts from the boiled roots for bowel and kidney disorders, rheumatism, worms, edema, asthma and venereal diseases. In the 1800's, American physicians also valued both the sap and root for treating conditions, particularly bronchitis and respiratory diseases. Some milkweeds were used for chewing gum, for which the sticky white juice is heated and stirred until solid. A tea from crushed leaves was used for measles, coughs and swellings. 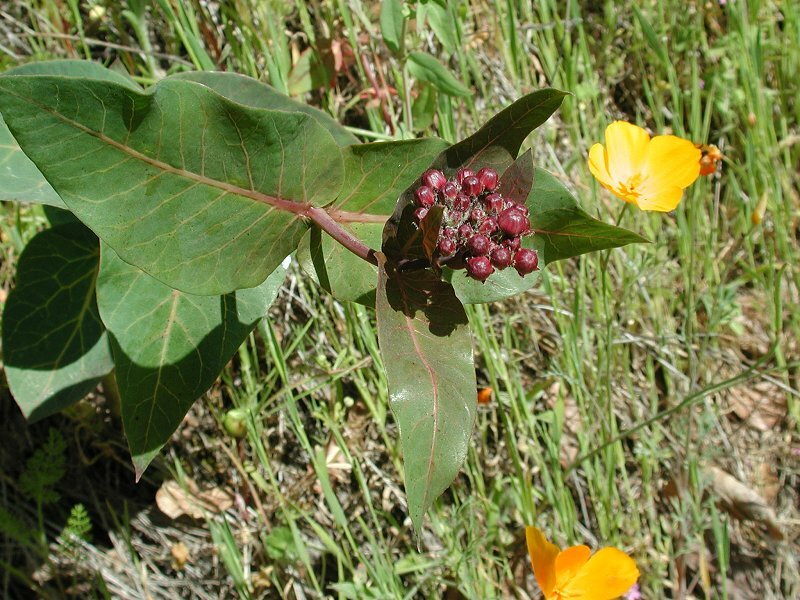 A tea from powdered milkweed roots was used as an asthma remedy and sedative. The entire plant was used to recover from childbirth. Canadian natives used an infusion of roots for temporary birth control. Some tribes ate the blossoms raw and the roots boiled (otherwise poisonous). The juice was used for cuts and wounds and also in tattooing. The juice would hold soot in place while it was pricked into the skin. Milkweed was once cultivated for the silky down from its large seedpods, which was used to stuff beds, pillows, and, during WWII, life jackets. The young shoots, flowers, and pods may be eaten, but only after being boiled in 3 or 4 different batches of water to remove toxic substances. The cooking water should be thrown away. Some milkweeds are made into cords, ropes and fibers for cloth or string/cord, hence the name cordiflora. The fibers were rubbed between the hands and thighs to form the cords. Asklepios was an ancient Greek physician -- what an apt name for this medicinal plant. The Monarch Butterfly species depends on Milkweed as food for its caterpillars. Look for the striped, greenish-yellow, caterpillars on the plants in the late spring.